LET'S face it, we all hate politics, at least the way politics here in Nepal currently poses threats of uncertainty. Uncertainty and yeah, ironically, the very existence of the band responsible for making a huge impact in the underground metal scene with a harsh anti political statement in the form of a landmark debut album Crying For Peace, came really close to ‘uncertainty’ due to line up changes and personal preferences. When suddenly the founding bassist and guitarist had to leave the band right after the release of X-mantra’s second album Kurshi, the future of the band and the motive for continuation as a band seemed overtly blurred and to some extent unthinkable. "It was really hard for us," said Rajan Pradhan, drummer, "when two of our founding members left the band. Rojesh and me, we were really totally clouded with indecision whether to continue the band". 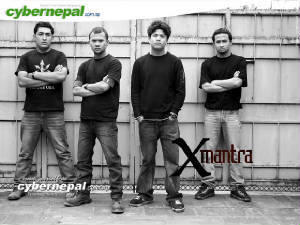 However, with the undying passion and dedication to playing metal and eventually to help shape the snail-paced metal scene in Nepal, X-mantra is still here to drill metallic vengeance and shred even tiny traces of disbelief into pieces. Yeah Yuddha Ajhai Jari Nai Cha. Making their initial mark in the underground metal scene with a thrash metal album Crying for Peace that behold rooted and vengeful musical taste, serving up to lyrical inclinations with strict, concrete political connotations and social revelations, X-Mantra, with undeniable gravity, structured themselves marking the scene with a definite and aware stream of musical application which defied all the factions of labeled expectations and counter anarchical meetings. "The album did well enough to break any idealogical and musical barrier and even smashed the rumpled opinion of naysayers 'nepali lyrics and metal ? huh? '," exclaims the master of awesome vocal range, Rojesh Shrestha. The singles Shalik, Shahid and Chidiyaghar were explosive and soon the aftermath could be seen in the gigs where multitude of metal fans would start chanting and singing the mantric words along with the band. "I was totally amazed that they knew almost all the lyrics and would sing word to word with me", adds Rojesh. Stepping into the more faster and heavier realms of sonic torture their second album Kurshi, in many ways seemingly surrealistic yet fruitfully acclaimed, proved to be a static step into shaping communal underground perspectives and motivational factors. The follow up to the first album depicted a more brutally aware and musically elevating face of the band, which proved to be another milestone into the layering up of a legacy, critically acclaimed yet convincingly evolutionary. "We just wanted to be more heavier and faster without losing our own sound and groove. Even though hindered by incompetent mixing skills in the studio for one more time, the album solidified into a thrashy record with sporadic influences from death metal bands too", explains the vocalist. "Lyrically, the songs have the same messages of political, historical and social stories but delivered this time with more venom and spite. Songs like Jaa Maar, Raata Raat, Juka are a direct smack on the faces on the impotent social heroes". e Yuddha is still on. m soon after the Nepali New Year". Indeed, the Yuddha is still on.